G5 PowerBooks by the End of 2004? Are PowerBooks Really Ready to Replace Desktop Macs? "Reconoció después que la revolución decisiva será la introducción en los portátiles del nuevo chip de 64 bits, G5, que la compañía ha desarrollado junto a IBM, con una inversión de 3.000 millones de dólares. 'Estamos trabajando en ello y lo que nos gustaría es conseguirlo para finales del año que viene', afirmó." "He said that the decisive revolution will be the introduction of portable computers with the new 64 bit G5 chip that the company has developed with IBM, with an investment of 3,000 million dollars. 'We are working in it and what we would like it is to have it ready for end of the year,' Jobs affirmed." "3,000 million dollars" sounds pretty steep and refers to the entire cost of IBM's microchip plant, but this is encouraging news for the future of the PowerBook. Have the hinges on your Titanium G4 PowerBook seen better days? MacResQ has announced a new PowerBook G4 hinge replacement service as part of their PowerBookResQ repair program. The new service offers PowerBook G4 owners a quick and easy way to replace damaged hinges on their G4 PowerBook with PowerBookResQ's famous service and nationwide convenience. The price for the hinge replacement is $499 and includes pickup at the customer's location in MacResQ's custom PowerBox, overnight delivery to the PowerBookResQ service center, expert hinge repair, and return overnight shipping to the customer. The flat-rate price includes repair of one or both hinges as needed. Due to the bonding required to attach the new hinge(s) to your PowerBook, this repair takes 48 hours to complete. To get started, customers simply call 1-866-MAC-REPAIR or visit the PowerBookResQ Website. PowerBookResQ and PowerMacResQ also offer fast and convenient Mac repairs for $99, which includes 3-way overnight shipping, the initial diagnostic service, and their unique PowerBox, which the customer may keep for future use. For even faster service, same-day pickup is available in most areas of the country. For computer resellers and repair centers, PowerBookResQ and PowerMacResQ offer discounted rates on products and services. Computer dealers can send overflow service work or seamlessly outsource their entire Mac repair operation. Volume discounts are available for schools, corporations and government agencies. The Smart Alec daypack features clean lines and stealth styling. 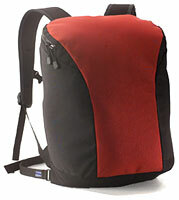 The top zipper to the main compartment features a waterproof zipper. There are also two exterior pockets, "hidden" in the side panels. If you're tired of backpacks with endless geegaws, bungee cords, and buckles, this is the bag for you. Add any size of Tom Bihn Monolith laptop case and the Smart Alec becomes the answer for those who want a laptop backpack but find the Tom Bihn Brain Bag to be too big - the Smart Alec is perfect for people less than six feet tall. If the organizer pocket with room for pens, business cards, a cell phone/PDA, etc. on the inside flap at the top of the Smart Alec just isn't enough, consider adding the Freudian Slip , an accessory slip that keeps your papers and files neat on one side and extra pens or small electronics organized on the other. #10 water-resistant zipper on main compartment and #9 YKK zippers on pockets. 1/4" padded straps with removable sternum and waist straps. Vix Inc., has announced that TiArmor, which covers and protects PowerBook G4 paint, is now available for all models, including 12", 17", and both 15" models. TiArmor is available in clear and gray, and is made of a durable, yet soft, polyurethane material that is used by the U.S. space program. Featuring a peel-and-stick adhesive, it is easy to install and may be removed later without causing further damage. Vix offers TiArmor in three pieces to specifically cover the front edge, wrist rests, and top cover of your PowerBook. The Japanese Kodawarisan site has posted teardown photos showing the internals of the the new 15" aluminum PowerBook. There are also teardown photos of the 12" and 17" PowerBooks, as well as a "skeleton iBook" on the site. Looking to sell your 'Book or to find a good deal on a used one? PowerBook Central offers free PowerBook and iBook classified ads. The classifieds are totally free (no catch), and PBC has nearly 8,000 registered members. There are categories for all the PowerBooks and iBooks, from the newest 1.33 GHz screamer to the original Mac Portable. The classifieds are active, and folks are typically able to buy or sell a laptop quickly and with little fuss. It's a safe haven from the chaos that is eBay. The new DryZone 200 from LowePro is the first soft-sided camera backpack that's completely waterproof. 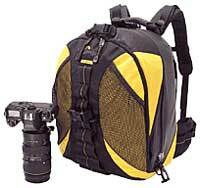 Even if this backpack falls into the water, your photo and electronic gear is completely protected. With the zipper closed, this unique backpack floats - even fully loaded. While it's intended to protect camera equipment, the DryZone 200 could also accommodate a small laptop like an iBook or LittleAl. The DryZone 200 has three components. At the heart of the DryZone is a waterproof case - think of it as a drysuit for the backpack. The drypod has a hi-tech TIZIP zipper that you can close for watertight protection. When you're away from water, sand or snow, you can fasten an inner zipper and top clip, and leave the TIZIP open for faster, easier access to your equipment. Inside the drypod is a heavy-duty camera compartment, completely customizable for a variety of systems. Wrapping it all up is the backpack, which includes a tuck-away tripod holder, two self-draining outer mesh pockets, generous inner mesh pockets, a drain hole for the pack, an ergonomic, fully adjustable backpack harness, rubber handle and attachment loops for SlipLock add-ons on the padded waistbelt and the contoured shoulder straps. SideTrack is a replacement driver for the trackpad (touchpad) found on PowerBooks. It brings many of the trackpad scrolling features found on Windows laptops to Mac OS X. Most Windows laptops implement trackpad scrolling using drivers made by Synaptics. Although PowerBooks also use custom Synaptics trackpads, the standard Apple driver uses none of the special Synaptics features. Compatible with uControl, including uControl's scroll emulation. SideTrack is fully multiuser aware; different users on the same PowerBook can have different settings depending on their needs. SideTrack is presently a public beta. As a beta release SideTrack may contain bugs and could potentially cause a kernel panic. This public beta version of SideTrack will expire on November 30, 2003. "Steve Jobs asserts that laptops will soon replace desktops. I assert that 'heavy lifting' will continue to be done by desktops, especially ones with dual processors. "...PowerBooks lag significantly behind the newest desktops. If you need a 'professional grade' computer that can get things done in a hurry, you better hope the PowerBook isn't your only computer." Yellow Dog Linux is a complete Red Hat and RPM-based operating system for PowerPC computers. Yellow Dog Linux version 3.1 is Terra Soft's most recent release which offers a completely rebuilt Installer, 1,300 packages on 6 CDs (3 install, 3 source), a unified KDE and GNOME desktop environment featuring shared menus, applications, and user interface. Based upon the "Anaconda" installer engine, the Yellow Dog Linux installer leverages automated, advanced hardware detection; provides onscreen help, flexible package selection, multiple install methods (CD-ROM, FTP, HTTP, NFS), creation of ext3 partitions, embedded XFree86 (video) testing, multiple ethernet and wireless port configuration, and automated partition creation. You have never before seen anything like this on your Mac. Wanting to spiff up that PowerBook 3400? How about serve email from your 7500? Got an 8500 or a beige G3 that's itchin' to try something new? Yellow Dog's full featured graphical environment runs amazingly fast and stable on older Apple hardware - as well as the latest that Apple has to offer. Notable, new hardware support for Apple eMac, GeForce 4 MX-based Power Macs, PowerBook 12"
With enhanced support for the latest ATI and NVidia graphics cards (full 3D support for the ATI Radeon series), "video issues" are a thing of the past. Computer users who wish to have easier access when connecting their peripherals can now do so with the new compact Belkin Hi-Speed USB 2.0 4-Port Hub. Its reversible and stackable design allows the unit to be positioned toward the back of the desktop for efficient cable management, or toward the front of the desktop for easier port access. The $29.95 hub will begin shipping in North America on September 30, 2003. The Belkin USB 2.0 4-Port Hub offers four 480 Mbps ports together in one compact unit that is the size of a deck of cards. With a sleeker and more compact shape over previous USB 2.0 hubs, this Hub will allow you to connect up to four peripherals, quickly and easily. The included power cable and device cable are right-angled, which allow the hub to be positioned toward the back of the front of the desktop. The Hub is self-powered and allows cascading, so that up to 127 USB devices may be connected to a single port. Computer users who are tired of digging around in the back of their computers to manage device cables can now have easier access when connecting peripherals with the new Belkin Hi-Speed USB 2.0 7-Port Hub. Speaking to the demand for easier access to connected devices, this Hub features two top-loading 480 Mbps ports, ideal for accessories such as flash drives and USB lights, and five horizontally mounted 480 Mbps ports. The $49.95 hub will begin shipping in North America on September 30, 2003. The Belkin 7-Port Hub saves desk space with a stackable and attractively slim design-with the thickness of two candy bars. Monitoring device activity is simple with LEDs for master power status and all port activity. The Hub installs with the convenience of Plug-and-Play ease and works seamlessly with USB 1.1 and USB 2.0 devices. "We've heard complaints from people about the hassle of cables when unplugging their devices," said Gavin Downey, Business Unit Manager. "So, we created a hub with two top-loading ports so that people can quickly plug and unplug their devices without dealing with the tangled, messy cables." The SmartDisk CrossFire external hard drive instantly adds high-performance storage in an attractive design for your PC or Mac. Connect it to either a FireWire or USB 2.0 port and you're ready to store thousands of digital photos, videos, MP3 songs, and other electronic files. Powered by a 7200 RPM hard drive, the CrossFire blazes through the most demanding audio/video applications allowing you to work more and wait less. CrossFire delivers outstanding quality, performance and reliability for both professional and home use. Still a raft of refurbished iBooks and PowerBooks at the Apple Store.